You’ve seen the traditional Arab headdress before. Fashioned from a rectangle scarf usually made of cotton, the ghutra, as it is known (in Arabic, it’s كوفية‎‎ kūfiyyah), is commonly worn by men in the UAE. 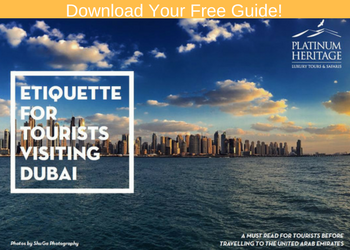 When visiting Dubai, understand the ghutra serves many practical purposes. It protects against sunburn. Typically the color white, the ghutra also keeps you cool during hot days. Or, during cold nights, you can get a thick one for warmth. Also, the ghutra offers protection against dust and sandstorms, which comes in handy, especially if you go on a desert safari on the outskirts of Dubai. Now you understand why the Bedouin have worn these headdresses for ages. And you probably want to wear one, too. To start, half-fold the ghutra. Do not fold it in half—rather, fold one end to the halfway point. When you put the ghutra on your head, place the folded half over the top of your head. The unfolded half should be on the back of your head and neck. There are two ends hanging down over the front of your body. Give both sides two turns moving in the outwards direction (not in toward your body). It’s time to showcase your flexibility. Pull the two ends over your shoulders and cross them behind your head and neck. Doing this provides the ghutra with the signature bulge at the bottom of the headdress. Once the two ends have been twisted and crossed, bring them back to the front side of your body (one dangling over your left side and one over your right side). Now it’s time to really test your coordination. Take one end and wrap it over your forehead and around the back. Tuck and squeeze it into a pocket on the back of your lower head. Note: Lines, or layers, are important to how the ghutra looks. Great ones can get 10-plus lines, which can be hard for beginners. Try for two lines or layers of cloth for the first end. The second end is what will be mostly seen by others. Wrap it around in the same manner. Again, try for two lines. Another thing you can do here is slide the end through to create a tail-like appearance on the side. After that, check the back and front to make sure it all looks all right. Chances are you may need to try this process a few times before getting good. Remember: Practice makes perfect. It’s time to wear your ghutra! 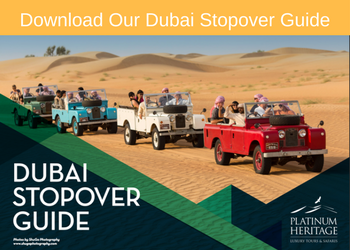 If you’re thinking of stopping over in Dubai, take a look at our full Dubai Stopover Guide.